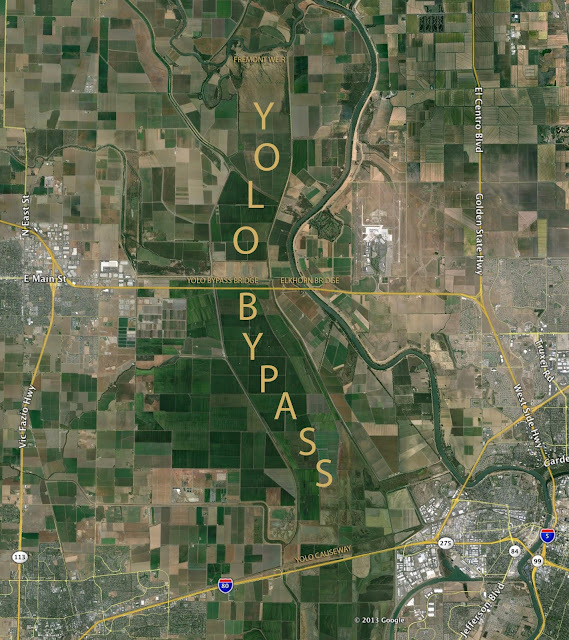 The Yolo Bypass protects Sacramento from flooding by allowing the Sacramento River to spill over the Fremont Weir and fill a low lying area with water during the winter (see Google earth map below). Several long viaducts cross over the Yolo Bypass. Just west of the Elkhorn Bridge that we studied yesterday are the 8,711 ft long I-5 Bridges over Yolo Bypass (22 0124L/R). They are prestressed concrete, cast-in-place, box girder bridges that were built in 1969. The superstructures sit on drop bent caps supported on pile extensions. These bridges are in much better shape than the adjacent Elkhorn Bridges and have a sufficiency rating of 89.1. The surrounding land is lush green rice fields, mostly owned by the Conaway Ranch with signs warning trespassers (like me) that deputized guards will arrest us. Rice is an important commodity in this part of Yolo County and the nearby Port of Sacramento ships rice all over the world. Yolo County, California Bridges: I-5 Bridges across the Yolo Bypass by Mark Yashinsky is licensed under a Creative Commons Attribution-NonCommercial-ShareAlike 3.0 United States License.